Sandstone Rockface Walling manufactured by J.H. Wagner & Sons. Rockface Walling is produced as a further process to the split or guillotined finish. The Rockface finish gives the stones a nice neat jointing line and the face of the stone a varying and more rounded or protruding face. The depth or amount of protrusion in the Rockface may be varied by how much material is chiselled away after splitting. All four sides of the Sandstone Rockface Walling are diamond sawn and the back is usually split unless specified to be sawn or rockfaced. The striking colours of natural Helidon Sandstone combine very well with the protruding rockface to create a project of historical appearance or the latest modern style. Standard heights provided in Sandstone Rockface Walling are 100mm, 150mm, 200mm, 250mm and 300mm high with the lenth of pieces being random. 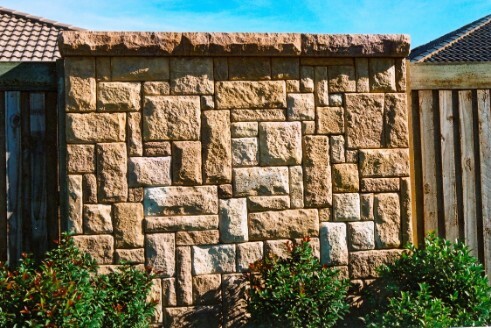 Sandstone Rockface Walling can also be manufactured to an Ashlar Pattern (see bottom right).